January 11, 2018 – The Women’s Basketball Hall of Fame announced its 10 finalists for consideration for induction into the Hall of Fame on ESPN during the Notre Dame at Louisville game (7:00 p.m. ET). The 10 finalists for the Class of 2018 are: Yelena Baranova (international player), Ceal Barry (coach), Rose Marie Battaglia (veteran, contributor), Christine Dailey (contributor – assistant coach), Mickie DeMoss (contributor – assistant coach), Chamique Holdsclaw (player), Vickie Orr (player), Katie Smith (player), Valerie Still (player), and Tina Thompson (player). The Class of 2018 will be selected from the 10 finalists and announced on ESPN2 on February 12 during the Louisville at Connecticut game (7:00 p.m. ET). January 11, 2018: Announce 10 finalists for the Class of 2018. February 12, 2018: Announce the Class of 2018 and the 2018 Trailblazer Award recipient. March/April 2018: Introduce Class of 2018 and 2018 Trailblazer Award recipient at media events conducted at the 2018 NCAA Women’s Final Four (Columbus, OH). June 9, 2018: Induction of Class of 2018 (Knoxville, TN). 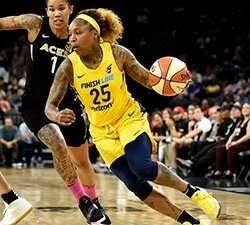 The 2018 Induction will mark the 20th anniversary of the Women’s Basketball Hall of Fame, which held its grand opening and inaugural induction in 1999. When the Class of 2018 is officially inducted in Knoxville, TN on June 9, more than 160 individuals will have been inducted into the Women’s Basketball Hall of Fame. The Women’s Basketball Hall of Fame Board of Directors serves as the selection committee in determining the individuals to be inducted each year. 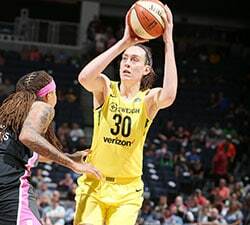 Voting is based on minimum candidate requirements, which include record of performance, national or international recognition, and contributions to the game of women’s basketball. For information regarding the Women’s Basketball Hall of Fame or the 2018 Induction Ceremony, please visit www.wbhof.com. The mission of the Women’s Basketball Hall of Fame is to “honor the past, celebrate the present, and promote the future” of women’s basketball. YELENA BARANOVA – (International Player – Russia) 1992 Olympic Games gold medalist. 1998 European Player of the Year. 2001 WNBA All-Star. CEAL BARRY – (Coach) All-time coaching record of 510-284 in 26 seasons with 12 NCAA tournament appearances, including six Sweet 16, and three Elite Eight appearances. Big Eight Coach of the Year four times (1989, 1993, 1994, 1995). 1994 U.S. Basketball Writers Association National Coach of the Year. ROSE MARIE BATTAGLIA – (Veteran – Contributor) NJCAA Hall of Fame inductee with four NJCAA Final Four appearances in 38 years of coaching and an overall record of 702-240-2. Led Paramus Catholic High School (Paramus, New Jersey) to two consecutive state championships. 1998 WBCA Jostens-Berenson Lifetime Achievement Award recipient. CHRISTINE DAILEY – (Contributor – Assistant Coach) As Connecticut’s top assistant coach for the last 32 years, the Huskies have posted a 991-135 overall record en route to 11 NCAA National Championships. Helped develop 19 Huskies into First Team All-Americans and eight National Players of the Year. Inducted into the Connecticut Women’s Basketball Hall of Fame and the New England Basketball Hall of Fame. MICKIE DEMOSS – (Contributor- Assistant Coach) Her overall record as an assistant coach is 829-200. As an assistant, she helped guide Tennessee to six NCAA National Championships and 12 NCAA Women’s Final Four appearances. Two-year stint as an assistant for the Indiana Fever including their 2012 WNBA Championship season. CHAMIQUE HOLDSCLAW – (U.S. Player) All-time leading scorer and rebounder at Tennessee, leading the Lady Vols to three NCAA National Championships (1996, 1997, 1998) and was recognized as a four-time Kodak/WBCA All-American and two-time WBCA NCAA Division I Player of the Year. Helped guide USA Basketball to a gold medal in the 2000 Olympic Games in Sydney. 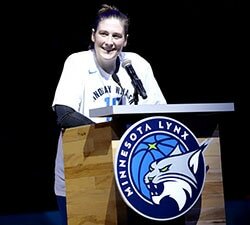 1999 WNBA Rookie of the Year and a six-time WNBA All-Star. VICTORIA “VICKIE” ORR (U.S. Player) – Three-time Kodak/WBCA All-American (1987, 1988, 1989). Ranks third all-time at Auburn University in scoring with 2,035 career points, leading Auburn to two NCAA Women’s Final Fours (1988 & 1989). 1988 SEC Player of the Year. KATIE SMITH (U.S. Player) – Three-time Olympic Games Gold Medalist (2000, 2004, 2008). Led Detroit Shock to two WNBA Championships in 2006 and 2008, and was named the 2008 WNBA Finals MVP. Two-time Kodak/WBCA All-American (1993 & 1996) and Big Ten Player of the Year (1996) while at Ohio State. VALERIE STILL (U.S. Player) – Kentucky’s all-time leading scorer and rebounder, guiding them to the 1982 SEC Regular Season and Tournament Championships. 1982 & 1983 Kodak/WBCA All-American. First female to have her jersey retired at Kentucky, in any sport, and inducted in the charter class of the University of Kentucky’s Hall of Fame. TINA THOMPSON (U.S. Player) – Two-time Olympic Games Gold Medalist (2004, 2008). Number 1 pick in the inaugural 1997 WNBA draft, guiding the Houston Comets to the first four WNBA Championships (1997-2000). 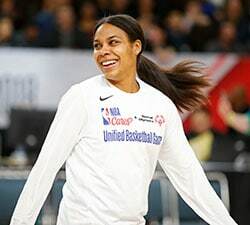 Named one of the WNBA Top 15 Players of all time in 2011.